One of my favorite ways to start the day is with a stroll to my favorite patisserie, O’Douceurs. A pretty little spot, with comfortable couches, where a perfectly prepared, frothy latte and a flaky just-baked chocolate croissant, get my morning off to the best start. But it’s not the streets of Paris I’m ambling through…this is Hanoi. Vietnam’s capital and home to some 10,000 expats, myself included. 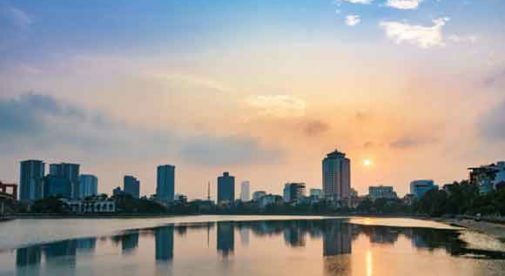 Hanoi was founded over 1,000 years ago, occupied by the Chinese and later by the French… and the French influence lingers throughout the city. My husband, David, and I live in the Ba Dinh District—also known as the French Quarter—with its wide, tree-lined streets, French colonial architecture, and lush, verdant parks. Quite a few expats choose to make their home in Ba Dinh, it’s off the tourist trail but convenient to the city center. From my house I can be in the city center in 10 minutes by bus or taxi or walk the 40 minutes to Hoan Kiem Lake (Sword Lake), the cultural and commercial heart of the city. This is the center of Hanoi’s Old Quarter, a densely populated jumble of temples, shops, public buildings, and homes. Most streets have a specialty—a tradition dating back to around the 13th century—selling everything from teas and traditional medicine to bowls, bamboo, tin, toys, and cloth. Our home is less than five minutes’ walk from the Fine Arts Museum of Vietnam, an easy 10-minute stroll to historic Ba Dinh Square—where Vietnam first declared its independence—and just 15 minutes from Lenin Park, where you’ll find a larger-than-life statue of Vladimir Lenin (the only one remaining in Vietnam). You get great value for money in Vietnam. For our typical Hanoi house—long, narrow, and several floors high—down a quiet lane, we pay around $660 a month. We’re about 160 feet or so from the main road—just far enough back that the traffic noise can’t reach us. When our landlords come to collect the rent…they always bring some fruit or Vietnamese treats with them. It’s only after we’ve had a chat over a coffee that any money changes hands. We’ve had the same housekeeper for over three years. She comes once a week and often brings us some ears of corn or a bunch of bananas, and we’ll send her home with some of our own treats, along with the $10 that we pay her for a full day’s work. Every month, we’ll get a knock on our gate from the ladies collecting our water and internet charges…we don’t share much common language, but we always laugh together and do our best to communicate. Our water bill seldom exceeds $2 and our high-speed, fiber-optic internet costs just $11 per month. Our typical monthly budget averages around $1,200 and rarely exceeds $1,600—but that includes travel in the region and little luxuries, like fine wine or evenings out. Tickets for a recent trip to the Hanoi Opera House cost us just $60—that included a drink each, and we had a great view of the stage. We’ve lived in Vietnam for five years…three of them in this neighborhood…and we love it. Sometimes it’s hard to believe we’re living in the country’s second largest city, there’s such a warm, village feel here. We shop at a traditional market near our house, our favorite vendors recognize us and bargaining is rarely a part of our shopping experience. Two pounds of tomatoes won’t cost more than 50 cents and two pounds of giant prawns, still swimming, (you don’t get much fresher than that) can be had for $13. Hanoi has an active cafe culture—another aspect of French influence. You’ll find coffee shops on almost every street, bustling with customers who all seem to be old friends, passing the time, discussing everything under the sun. So, with the day’s shopping done and after a stroll in the park and taking in a museum, I’ll pop back into O’Douceurs and face the tricky task of choosing a dessert. A creamy St. Honore pastry (a puff pastry named after the French patron saint of pastry chefs), a rich Paris-Brest (dessert made of choux pastry) bursting with hazelnut praline cream, or a thoroughly decadent chocolate feuillantine (thin pastry) cake. Choosing can be difficult, but none of them will set me back more than $2.50. How would I describe Hanoi? A little flavor of Paris…without the price tag.